Banglalink Mega Offer on Megabytes! Hello Dear, Welcome to Banglalink 25% Bonus Internet Offer on below 100 TK Internet Pack from Online Platform. The Bangladeshi 3rd biggest and popular telecommunication company brings an Online base 25% Bonus Internet Offer for their valuable customers. 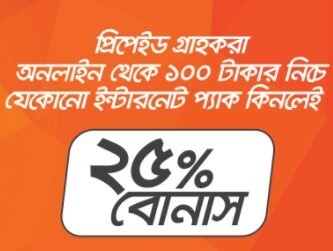 All the Banglalink Prepaid and CnC connection users are eligible to enjoy 25% mega bonus upon purchasing internet packs worth below BDT 100 through digital channels. 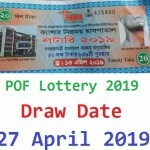 If you are a Banglalink connection users and want to enjoy Banglalink Online Base Interent Package 25% mega Bonus Offer, just follow the below content. If customers buy any above internet package from the online platform like as My Banglalink App, Banglalink Website, and eSelfCare, then they eligible to enjoy 25% Mega Bonus Internet Offer. For example, After Buying 500MB / 5 days @ Tk. 49 internet pack, customer will get 125MB bonus. VAT + SD + SC is included. To check the Banglalink 25% bonus Internet Offer and regular internet balance, just dial USSD code *124*50#. Thanks for staying with us a long time and visiting Banglalink 25% Bonus Internet Offer on below 100 TK Internet Pack from Online Platform content. If you have any question about the Banglalink Mega Offer on Megabytes? Just comment here. We reply as soon as possible.